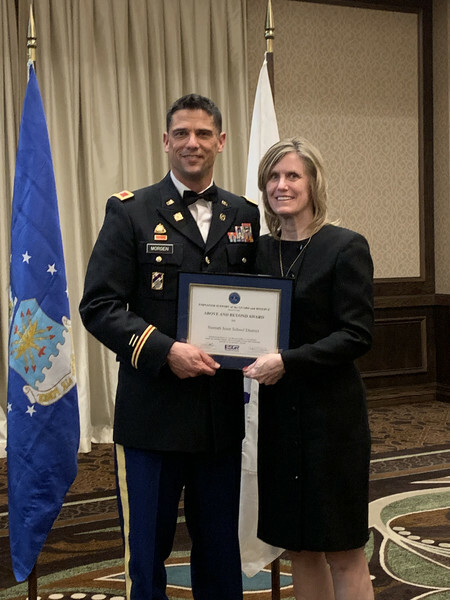 The Neenah Joint School District was one of nine statewide recipients of the “Above and Beyond Award” and one of three public sector employers honored by the Wisconsin Committee for Employer Support of the Guard and Reserve. The recipients were honored at an awards banquet in Elkhart Lake on March 30. Neenah High School teacher and boys cross country coach John Morgen, a colonel in the Army Reserve who recently completed a one-year deployment in the Middle East, nominated the School District for the award. Morgan added that the District has held events over the years to support the people and schools in the areas in which he and other staff members have been deployed. The District has also provided employees assistance with health care benefits during deployments. Other Wisconsin public sector employers who received the award were the Sparta Police Department and Greenfield Fire Department.